Hang your heads in shame, oh ye Americans! For, this time, Britain has won the race. They have now established an archive to preserve the diaries and journals of the common person. I know that this archive has been years in the making. Congratulations and sincere best wishes for our partner across the sea! It is my goal to maintain ties with their organization and share information. Since my ancestors were Brits prior to 1645 (messy little Revolutionary War aside) I am hoping to be allowed honorary membership in their group. As described below, the creation of an archive requires these elements: “enthusiasm” and involvement from volunteers interested in the project, a physical location to house the archive, acquisition of diaries, non-profit status and financial support. It is my dream that someday we will have an archive in the US. Diaries are a valuable social and historical resource; they offer a window to past lives of a huge spectrum of people, building an image of their lives and the developments which fed today’s society. At the moment these too often meet a wasteful end. The Great Diary Project aims to stop this by establishing a Diary Repository which will house and make available these valuable commodities. To do this requires a mix of 1. Enthusiasm for the cause from those involved 2. Finding a home for collected diaries 3. Diary collection and 4. Raising public awareness. My role is to use social media in order to achieve 4. and so encourage 1. 2 and 3. This blog therefore aims to captivate your enthusiasm through a personal account of the project and so urge you to take a look at our website (link), like us on face book (link) and follow us on twitter (link) and generally spread the word. First, a disclaimer: This blog tells the story of the project from an entirely personal perspective; were you to speak to others from the project, you would likely find a whole multitude more of opinions and experiences. This is partly because I could not find the words or space to properly articulate each persons story. But also because I believe in the cliché ‘passion inspires passion’; a personal story allows for proper communication of my belief in and experiences of the project. Herein follows my story of the Great Diary Project. October 2009; I am inevitably running late for a final year University class. This doesn’t stop me pausing to listen to a radio interview, then manically googling to find who the speaker was (otherwise known as internet stalking a radio interviewee). The reason being that the topic was diaries, and one of the one of the interviewees (Irving Finkel) was exhorting the need for a national Diary Repository to save this fantastic piece of history. At the time I was working on my dissertation and essentially it would have been a whole lot easier had I been able to read a few contemporary accounts which told me exactly what people at the time thought. I have also kept diaries since childhood and have wondered of the conclusions which might be drawn about myself and my contemporaries were these found in years to come. I was hooked. I emailed Irving immediately – probably some nonsense along the lines of ‘wow this is so awesome I totally agree thanks for being on the radio, great, thanks.’- and fortunately for me he replied. Thus I was involved. Soon after Irving came and delivered a seminar and a lecture on the topic of diaries at the University of Leeds. With him Irving brought a selection of his favourite pieces; a diary, for instance, from a train spotter who every day logged the trains he saw, until one day entries abruptly stopped. One can only imagine. A mixed crowd of students, lecturers and friends were enthralled; no one left, even when the refreshments ran out and afterwards people crowded round to ask questions and congratulate the cause. At a later date I met with Irving in the primary diary store – his office. It was wall to wall, ceiling to floor and every other cliché in between which indicates the room was bursting at the seams with books. It was an amazing sight, but clearly not a viable long term solution. Between this point and now others have done fantastic and dedicated work. Diaries continued to be collected, a cataloguing system was begun, diaries inputted to this during lunch hours and at home, and a home for the collection continued to be sought for. Now we are pulling together even more to really push the Great Diary Project into the public consciousness. And for this to work we need you. So I reiterate; we need you to tell other people, like us on face book, re post our posts, follow us on twitter and re tweet our tweets. All that remains for me to say is thanks for reading and thank you to Cynthia for very kindly affording us a space on her blog. If you consider yourself a “loner,” and I suspect that many of us diarists fall into this category, then I am going to recommend a book that will help you hold your head up proud and banish to the dung heap all those taunts of anti-social behavior. 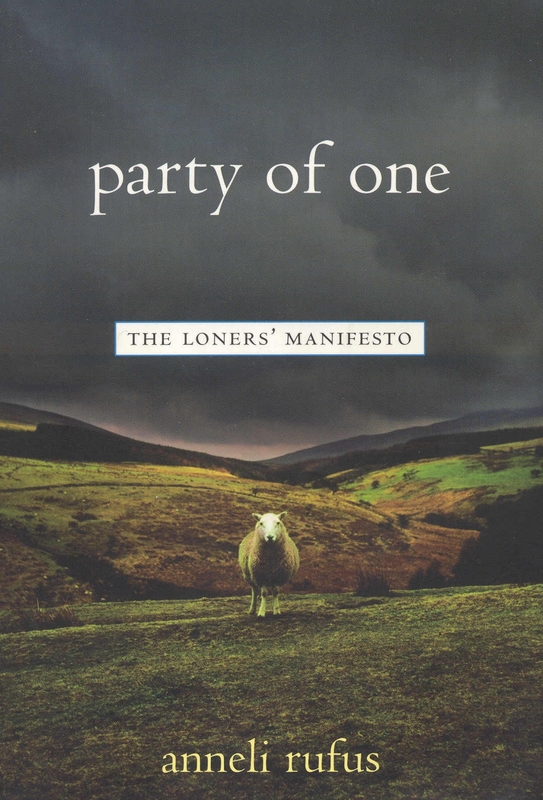 It’s called Party of One: The Loners’ Manifesto, by Anneli Rufus. Loners, you will love this book. It is definitely witty. And lyrical. I see someone else called the writer “provocative and passionate.” I enjoyed her writing immensely and not just because she was giving the old one-two to negative images of the loner. Rufus writes chapters on the loner and popular culture, friendship, film, advertising, religion, crime, literature, childhood, eccentricity, and more. She is sharp and perceptive. At my recent gathering of journal writers we discussed the accusation that one of us spent too much time writing about life and not being with other people. From a loner’s perspective I would ask “Do we need to spend time with other people?” (Just kidding.) From the smidgen of non-loner in my personality I would say “What you need is balance.” For a loner that balance might be 75%/25%…75 for you, 25 for social contact. We must have some connection. We all need some. (“All we need is love.”) We may not need as much as the non-loner. We tend to be more sensitive to things like the noise and confusion of a party and to be better at observing others and getting in touch with our own feelings and thoughts. We are not necessarily bad conversationalists but we do make mighty fine writers. I spend my days talking to people now. Sometimes talking with them and having great conversations. I am good at that. But when the clock says closing time I flee to my private sanctuary on my farm. I spend my home-alone time with my cats. They understand. They have spent the day being loners and when I come back they want to hang out as a tribe. But they are quiet. They enjoy watching me read and write, often helping by holding down the pages. When I write in my journal in the mornings I am actually meditating. I am meditating about all that I have seen and heard and felt during the day. I am examining the strange things others do that puzzle and frustrate me. I am trying to understand life because it is complex and it is not easy. I am leaving a bread- crumb path for others to follow. I suspect there are many other ” local” Northern Colorado people who are involved in promoting the creative discipline of journal writing. I am certain that each has a special niche within this field. It may be using art to illustrate your journal. It may be a focus on writing memoir, or coaching, or leading workshops and retreats on reflective writing. By the way, anyone across the country is welcome to contact me with information on your workshop and I will mention it in this blog. In my own backyard (Fort Collins, Colorado) we are privileged to have Joannah Merriman, who established “Lifeprints” in 1985 to promote reflective writing and has continued to expand and develop her foundation since then. There are many types of workshops available. One of the awesome opportunities offered through Lifeprints is the chance to go on a women’s journal writing retreat and guided tour of France or Italy. This year they will be traveling to Provence and Paris, France from May 4 to 20. On January 15, at my bookstore’s new retail location, I held a gathering for journal writers. To my dismay only two people showed up, although it was advertised through the local paper, flyers, at the store itself, and on Craig’s list. I am not sure what this tells me. There are so many ways to look at this. The bookstore is still unknown and perhaps I need to establish more social-political ties through networking. All three of us at the gathering were long-time journal writers: two older women and a man in his thirties. He had some concerns stemming from criticism that he writes too much. He works as a teacher. We talked about balance. I often observe that non-writers— especially people who do not keep journals— feel there is something harmful about recording your thoughts, feelings and experiences in a book, something loner-ish, as though you are a social misfit. Au contraire, I think this is a path toward mental health and a form of meditation that deepens your life…particularly when continued over a long time. Another issue we discussed was whether a diary archive should insist that all donations of diaries, journals and letters should be immediately open to the public or whether a donor could choose to keep them closed for a certain period of time to protect the people written about. My position is they should be allowed to be closed for whatever amount of time the donor wishes. There was some disagreement over this issue. You are currently browsing the National Diary Archive blog archives for March, 2012.